The high-speed Thaly's, just one of Europe's super-modern, super-efficient trains that make crisscrossing the continent not only fast and easy, but terribly Romantic. The shortest distance between any two points in Italy is usually laid with train tracks. Rail travel is the most popular way to get around, and with the exception of no-frills airlines is also the cheapest and most convenient means for long-distance travel. One big hint I will point out before we delve into the specifics: always do a load of research before deciding on the method of travel that will best fit your travel plans and budget. Use the "Fares and Schedules" feature of at Rail Europe (www.raileurope.com) to calculate the ticket cost for each and every one of your itinerary's planned train journeys. Then figure out whether some form of railpass will save you money, or if it would behoove you to use a no-frills airline, or consider whether you'll want to rent a car for exploring the back roads of Provence or Tuscany. Weigh all these factors before deciding on which combination of train passes, plane tickets, point-to-point rail tickets, and other means will serve you best and save you the most money. Once you have figured out when you'll be taking the train, here are some tips to help you cut costs. Italy Rail Passes are one of the original budget tools for European travel. It's like a ticket good for unlimited travel on the trains. Railpasses come in two main flavors: The regular, consecutive day railpass gives you, say, one month in which you can ride the rails as often as you darn well please. The cheaper flexipass versions grant you a certain number of unlimited-ride days you can use, one-by-one, at any time within a set time period, usually two months. Luckily, a "day" starts the evening before so you can take advantage of overnight trains (so if you board one after 7pm, you write the next day's date on the pass). First let's deal with passes that cover more than just Italy—since railpasses are usually best for wide-ranging vacations on which you'll be covering a lot of ground and bopping between countries. The granddaddy of them all, of course, is the famed Eurailpass: 17 countries (most of Western Europe, but NOT including the U.K.) for anywhere from 15 days to three months. The Eurail flexipass is good for 10 or 15 days of travel within two months. Then there are flexi Eurail Selectpasses , allowing you to choose of any three, four, or five adjoining Eurail countries; Multiple Country Passes (such as the France 'n Italy Pass , Greece-Italy Rail Pass , or the Eurail Italy-Spain Pass) for more focused trips; and national passes like the Eurail Italy Pass (a.k.a. the Trenitalia Pass). And still more varieties: the Italy Rail n' Drive Pass that mixes train days with rental car days; Eurail Saver Passes that save money for two to five people traveling together...the permutations seem endless. For far more detail on each of these kinds of passes, head to the railpassessection of this site. You can buy any Eurail pass from most travel agents, or order it on-line from Rail Europe (www.raileurope.com). If you're using a flexipass, calculate quickly how much per day it's costing you. Then, every time you go to get on a train, pop over to the automated ticket machine (or, if lacking, up to a ticket agent) and check out the price for the trip you're about to take. The money-saving benefits of using overnight trains—where a bunk in a couchette (train compartment) starts around €20–€30 ($30–$45), or you can take your chances and try to find an empty couchette to occupy for free—are covered in full here. I almost forgot to include this tip because it seems so obvious. Some cars on a train are first class (with seats that are ever-so-slightly wider and cushier), some are second class. However, all cars in that train will get to the destination at the exact same time. Why pay 20% to 30% more for a bit more seat padding? Unfortunately, adult railpasses are only offered in a first class version (though you can get youth passes in second class). Luckily, a first class ticket entitles you to sit anywhere on the train, so if you're taking an overnight run you can still use your first class railpass for the ride but book a couchette bunk in second class (much cheaper than a first class sleeping berth)—though the conductor will probably look at you funny. On overnight trains, always request one of the uppermost bunks. This really isn't a budget tip, more of a safety one, but it'll help. Yeah, the top bunk can be hotter, but it has its advantages. Kids under four ride for free on all Italian trains. Children between 4 and 12 ride for 50% off. The cut-off date is the day after one's birthday. Those of us past our mid-twenties are almost always stuck paying the full, "adult" price on everything. Same goes for train tickets in Italy, where students and seniors can get discounts if they know where to look. For youths: Those aged between 12 and 26 can buy a Carta Verde (Green Card) for €40 that's good for a year's worth of discounted train tickets, which is 10% on just about every train ride within Italy, 10% on reserving a sleeping couchette or Wagon Lits sleeping berth, and 25% on many international runs (with a few exceptions, like the Artesia to Paris and Elipsos to Barcelona). For seniors: Those over 60 can buy a Carte d'Argento (Silver Card) for €30 (over 75, it's free) that's good for a year's worth of discounted train tickets: 15% on just about every train ride within Italy, 10% on reserving a sleeping couchette or Wagon Lits sleeping berth, and 25% on many international runs (with a few exceptions, like the Artesia to Paris and Elipsos to Barcelona). Of course, this all means you have to do (ugh) math again to ballpark whether the student/senior card would cost less than the collective discount it'd get you on the total amount of money you expect to spend on rail travel, and hence would be worth your while. It can be a great discount for heavy travelers who will be in Italy for a while (especially study abroad students), but for shorter trips is probably not worth the bother. If it is, you can buy such cards from the ticket agents at most major rail stations. Purchase all tickets—or, if you're using a railpass, any necessary supplements and seat reservations (usually $10 to $30)—before boarding the train. You can usually buy any of this from the conductor once on board, but you'll pay a stiff penalty, often of 50% to 100%. Also be sure you stamp one end of your ticket at one of the little yellow boxes usually located in the passageways leading to the tracks and strapped to a column at (or near) the head of each track. If you do not, the conductor may fine you (they sometimes give tourists a stern warning, but more and more they are simply imposing the fines regardless). If you're buying your tickets as you go, any high-speed or other supplemental charges will be included in the ticket cost. If, however, you're using some form of railpass, you will still need to purchase a reservation for any train marked with an "R" on the schedule (most stations display big schedule posters). Also, read the pass's fine print carefully to find out whether certain trains require you to purchase a "high-speed supplement" on the faster trains, or whether a seat or couchette reservation is necessary. The concept of high-speed supplement is a bit complicated; your pass's fine print should spell out any concerns or special procedures you need to take. In brief, such supplements are often needed to ride the fastest trains, as well as ones which stop infrequently. 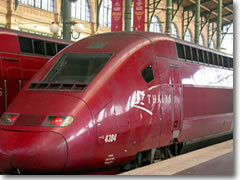 For more on this subject, read the section on the European train system. In British English, a "bus" operates within a city, a "coach" between towns; use those terms to help avoid confusion in Europe as many Europeans learn a more British form of our lingo. Better still, use the Italian terms: autobus for a public city bus, pullman for an intercity coach.Explanative disclaimer: Buses do, indeed, have to do with train travel in that the trains are better. OK, that's a bit of specious reasoning, but this bit didn't fit well anywhere else and it is germane to the discussion of connecting the dots on a European itinerary. With rare exceptions, an inter-city coach is not going to be any cheaper than the train or a no-frills airline. It will only (a) take longer, and (b) be less comfortable. These are not bonus factors when considering your options. Coaches are really only useful for getting to places where the trains don't go. Then again, these sorts of places—ones literally off the beaten (train) track—can make excellent destinations.